On May 27, 2015, the WHO reported that Ebola had infected 27,042 and claimed the lives of 11,148 in West Africa. The same day, the town of Baro in eastern-central Guinea hosted its nationally renowned festival of the pond at the height of the Ebola crisis. Puzzlingly, despite high transmission risks associated with crowded community gatherings, the Malinke-dominated jurisdiction and ancestral home to the current president of Guinea has remained Ebola-free. Was Baro’s success in containing Ebola pure coincidence, or was Baro’s politically powerful ethnic community key? Evidence seems to support the latter. In fact, a recent study on the transmission dynamics of Ebola in Sierra Leone documents that, compared to the politically influential Mende group, infection rates were 40-50% higher among other ethnic groups. I set out to better understand the link between ethnic politics and the local response to Ebola, and what I found was stark. More on my results later on, but Fig. 1 below gives you the basic idea: there is a clear link between the political prominence of an area and its incidence of Ebola: the more political elites that come from a district, the lower its suffering during the Ebola outbreak. Figure 1: Power Distribution and Ebola Cases (Estimated Coefficients). Estimated number of cases based on a Poisson QMLE is plotted against the share of ministerial positions held by the subdistrict’s dominant ethnic group in 1990-2004, after controlling for population density, the share of the dominant ethnicity, the number of health clinics, distance to main roads and Ebola treatment centers, and country fixed effects. In theory, the substantial heterogeneity in Ebola infection rates among ethnic groups could emerge for many possible reasons, including proximity to the epicenter of the outbreak, local development, socio-cultural practices, or religious preferences. Now, we see that ethnic favoritism and its detrimental effects on public service delivery and trust appears to also be a relevant factor. For instance, the lack of trust has triggered fierce community resistance to Ebola response in many regions across Guinea, Liberia, and Sierra Leone. To help understand the link between ethnic politics and the local response to Ebola, my research evaluated whether power distribution in government was associated with more or less vulnerability to Ebola. Specifically, I examined whether ethnic groups that historically held more ministerial positions experienced lower incidence rates from the deadly virus. The rationale is as follows: Disproportionately represented groups may be better prepared for a major epidemic because they’re likely to capture a larger chunk of public goods and services, e.g. education, health care, and infrastructure. They may also be more trusting in the state and its institutions, and thus be more inclined to facilitate effective interventions. Each subdistrict – chiefdom in Sierra Leone and subprefecture in Guinea – along the border has a dominant ethnic group, which makes it convenient to assign ethnic-level cabinet position shares to the jurisdiction. The fact that cultural preferences and geographic conditions are likely to be similar on both sides of the border, issues arising from endogeneity biases would be attenuated. As shown in figures 1 and 2 (below), I found a chilling result. Communities that generally held more ministerial positions exhibited a relatively stronger response to Ebola, after controlling for population density, the share of the dominant ethnicity, the number of health clinics, and distance to main roads and Ebola treatment centers. So in addition to limiting access to public goods, political marginalization may also inflict serious harms by increasing people’s vulnerability to crises. This analysis adds to the long list of lessons learned from the Ebola crisis, the need to push for institutional reforms that limit public goods misallocation. For example, concerted efforts in designing need-based targeting should be encouraged among aid agencies, regional bodies and national institutions. 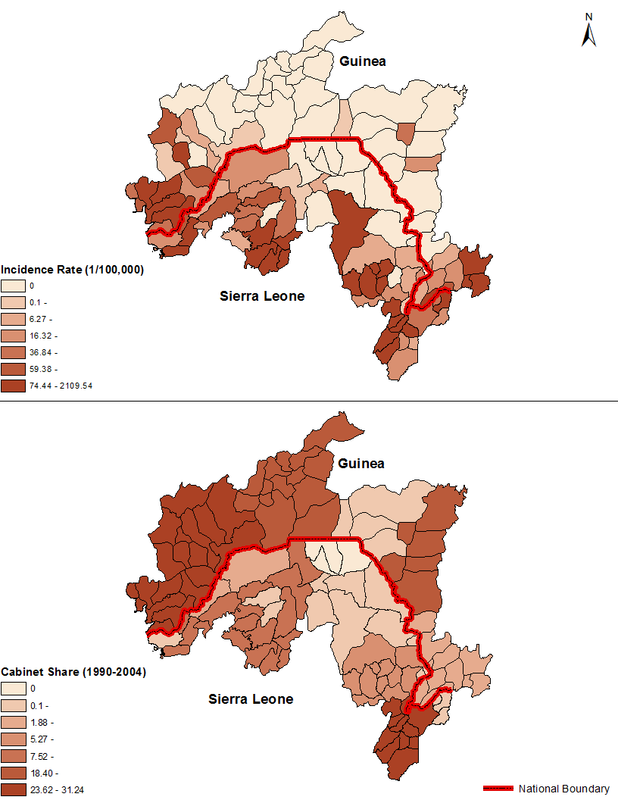 Figure 2: Power Distribution and Ebola Incidence Rates in Guinea and Sierra Leone. The maps here are based on the second level administrative units (District or Prefecture) along the border between Guinea and Sierra Leone. The main unit of analysis, however, was the third level administrative units (Chiefdom or Subprefecture) to capture more granularity. The map on the top shows the spatial distribution of the number of Ebola cases per 100,000 in each subdistrict. The map on the bottom shows the spatial distribution of ministerial positions held between 1990 and 2004 by the subdistrict’s dominant ethnic group. Data on Ebola come from Fang et al. 2016 and the WHO local office in Guinea. 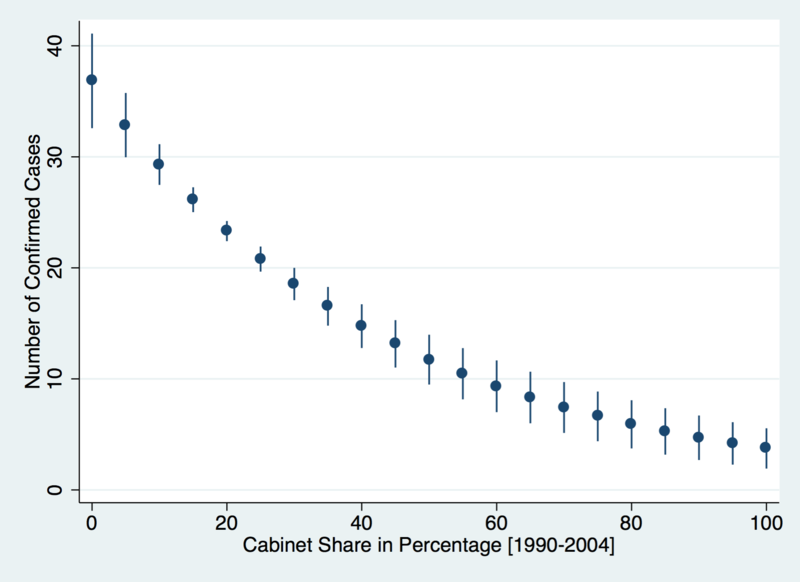 Data on cabinet positions held by ethnic groups come from Francois et al. 2015.